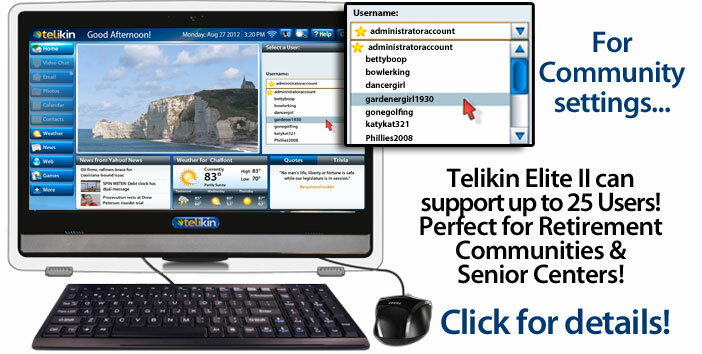 Telikin® – a simpler, easy to use touchscreen computer for seniors, the elderly and their families. Telikin is a simple and easy to use family computer that combines video chat, photo sharing, email and many more popular features into a sleek, touchscreen device. It's fun for young and the young at heart and easy to use for seniors, the elderly and their families. The stress and hassle of setting up a traditional PC is a thing of the past. Telikin comes with its software fully installed and ready to go out of the box! Just connect Telikin to your high-speed Internet provider and enjoy the experience! Face to face video chat is an exciting experience with Telikin. With three simple clicks, you can be talking face to face with a loved one or friend! Now Grandma can easily see and hear her grandchildren, whether they live across town or across the world! Our Photos app lets you view, edit and organize photos, either yours or your friends' and family's. Sit back and watch a slide show of your latest family vacation! The gift of Joy -- Many studies and articles have been written discussing the benefits to seniors using technology. When thinking about purchasing a computer or technology gift for a loved one, we envision the many ways they might enjoy using it. 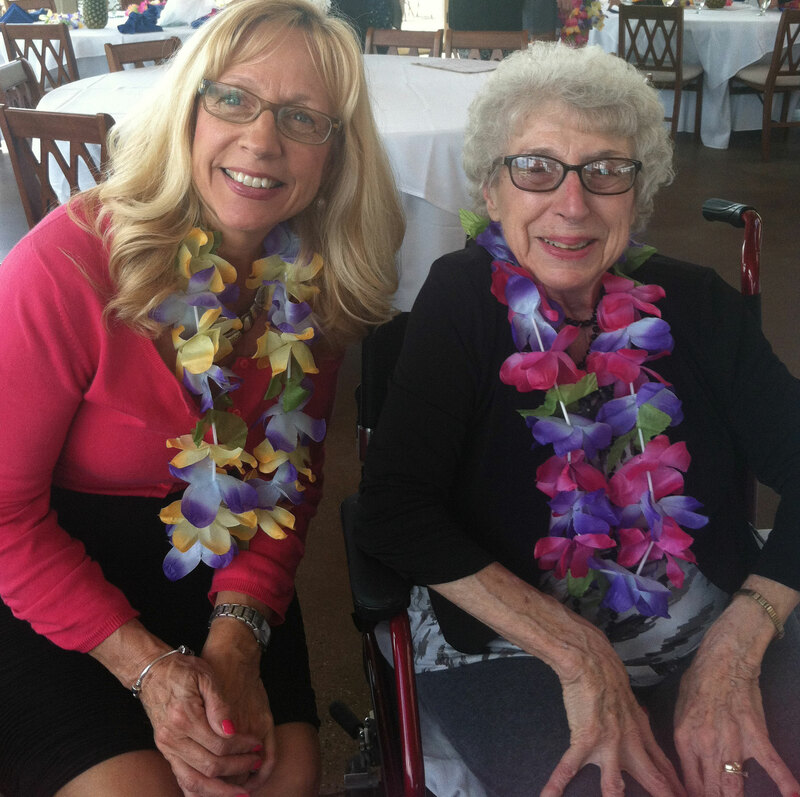 A tribute to my Mother -- This will be my first Mother's Day without my mom, Janet. She was diagnosed with Parkinson's disease in 2006 and, over the years, she had experienced the physical and cognitive issues that affect patients with PD. As her illness progressed, she couldn't do many of the things she always loved to do. 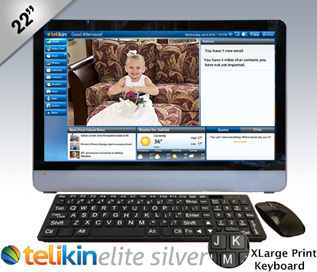 The 22" Telikin Elite Silver offers software with the same ease of use, worry-free benefits and features plus Text to Speech - it can read your emails to you! The Elite Silver senior computer has a roomy 32 GB Solid State Drive, an HDMI output, and Premium SRS Sound. It has a brighter display, 35% larger than the Breeze, and a Large Print Keyboard and Mouse! Whether you just want an easy to use, stress-free personal computer or you need the best senior computer ever made, the Telikin Elite Silver was designed specifically with you in mind. The Telikin Freedom offers software with the same ease of use, worry-free benefits and features plus in a package that's less than 5 lbs, it means you can take it anywhere! The Freedom senior computer has a roomy 500 GB Hard Drive, an HDMI output, and Premium SRS Sound. It has a bright, crisp display, and a CPU that's as fast as our Elite Silver! Whether you just want an easy to use, stress-free personal computer or you need the best portable senior computer ever made, the Telikin Freedom was designed specifically with you in mind. Call 800-717-7640 for Affordable Payment Options! Designed to be the world's easiest computers for seniors and baby boomers, whether you just want an easy to use, stress-free personal computer or you need the best senior computer ever made, Telikins are designed specifically with you in mind. Thanks to Telikin's ease of use, security and world-class VIP support, anyone can now enjoy the benefits of owning a computer... without the headaches. Of course, you also get the added value, comfort and peace of mind that all Telikin owners enjoy with our hassle free 100% Satisfaction Guarantee! and a full year warranty. We also have VIP Support available with the security of Online Backup. “I have to saythat without a doubt my buying experience with your company was a most satisfying event in every respect! I came in contact... with several members of your Customer Support team. And in each of those occasions, your front line people represented you and your company very well with their affability and high degree of professionalism. It's truly a awesome, innovative, fun to use PC. Obviously it was primarily designed with both simplicity and style in mind for senior citizens like me. “I just got the Elite 20 system for my mom and I want to say it is a very nice and easy to use system. Couldn't believe how quick it was to set up and love the 20 inch screen. In a matter of minutes I had it hooked up, running on our cable modem, and she was sending email for the first time in her life... [T]he computer is awesome and was extremely easy to use. First thing my mom said was it was very easy for her to read. 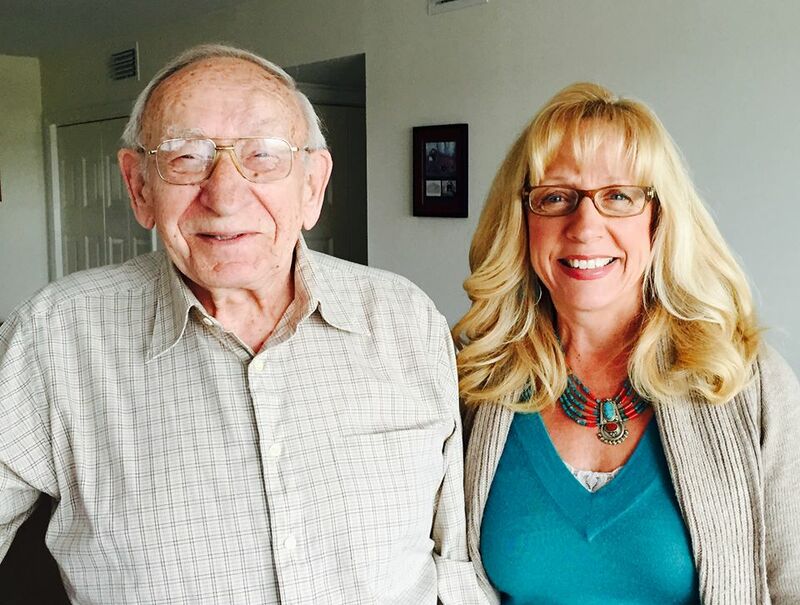 “I am so thrilled with the computer product and support system from Telikin!! Never before has it been so easy for me to get support and use a computer! I'm in heaven!! THANK YOU ! “I just wanted to say, that this was a great investment. I live with my grand parents, and my Grandfather can operate windows but when he makes a mistake or gets onto an unknown screen he didn't know what to do. I knew at the time I could have purchased a faster computer for a cheaper cost. However the key thing that Telikin provided was an easy to use operating system. I used to work for Dell in technical support. It really did eliminate half of the questions he would pop up on me, or call some poor tech in the middle of the night. Also I've noticed the improvements with some of the updates. The linux based os, eliminated his subscription to antiviral software, so he's recouped the higher cost in that savings over time. He's now 2 years later discovered Skype on it. I've used it a few times to talk to my friends, but now he's trying it with my family. He's now trying to see about getting the Bible on it, to read and listen to but I'd have to check it out first. We have been really happy with the product, most of the issues I have is with the printer any more. (he's never figured it out how to change the cartridges). Or he's left a writing pen that got stuck inside and is causing a jam. “My mom is 87 years old. She had WebTV for about 10 years and really enjoyed keeping up with friends and family via email. She especially liked to stay in touch with my son who is a Commander in the Navy and travels all over the world. Well mom's WebTV would not work anymore and she was very upset that she couldn't email. I did a Google Search to find out more about the WebTV and see if they made it anymore and found that they were not. Then I noticed on my "search" an advertisement for your Telikin Computer. I read all about it and the reviews. I sent the information to my sister and my grandson and we all agreed that this sounded like a great answer for my mother. Well she bought the computer and we had it installed along with WiFi. She is just going nuts playing with her computer. She never did anything but email, so this has been quite an experience for her. I showed her how she could check out the "news" portion of her screen. I showed her the "games" that she could play. I showed her how she could watch QVC live. My grandson would send pictures of our grand kids and she was never able to open them with her WebTV. Now with her new computer she can see everything, even the videos. “I just want to thank all the people at Telikin for making a product that is user friendly when as for me, I am not of the thechnical age. The product is great but even greater are the people of Telikin. In my opinion they are one big family and as for me they make me feel a part of their family. I have had nothing but wonderful experiences from the purchase to the set up on the technical side. No fustration on their part at my lack of computer knowledge. All I can say is if anyone has any doubt about Telikin in any way, just forget it, I for one am glad to be a part of the Telikin experience. “Kudos to the Telikin Team for crafting a solution for regular people. Yesterday the Telikin Elite arrived at Quail Haven Village for my 88 year young Mom. Out of the box, she said "It's beautiful". A manual ! Instructions ! How amazing is that ! Big colorful buttons ! Full Touch! A keyboard that you can actually see the letters ! As friends stop by..Mom says "Isn't it beautiful?" Easy to get connected, easy to get going, just follow the instructions. I called the customer support line to help figure out something...an actual person answered, in English ! .. and then he took control of my Telikin and we watched him fix it. That's they way its supposed to be. Awesome! As we were deciding to select a new computer to replace her corrupted XP PC, I was reluctantly thinking that we would be replacing it with a Windows 8 platform...(I was hoping for a Windows 7 platform) .. the typical Microsoft approach..which I have never liked. Operating Systems are not solutions...they are just plumbing for techies. Regular people, especially our seniors and now boomers, want solutions. Things that work...all the time. Just like a toaster.! “I received my Telikin with no problems. I kid you not, in the time it took me to make my morning coffee, I had my mom's computer up and running and her gmail downloading. I wanted to test it out and get it set up before reboxing it and giving it to her for Christmas (my kids want to give it to her at Thanksgiving instead of waiting for Christmas). I've bought many electronics over the years and many computers, and never do they really live up to the hype or the allure of making your life simplier as portrayed in the slick advertising. I'm rather skeptical when it comes to electronics for that very reason. Well, you proved me wrong. After using the Telikin for about 2 hours I can honestly say that it does exactly what you advertise. In fact, your ads really do not do it justice because it's an absolutly beautiful product, genius in it's simplicity, and it works flawlessly. Beat that Apple! 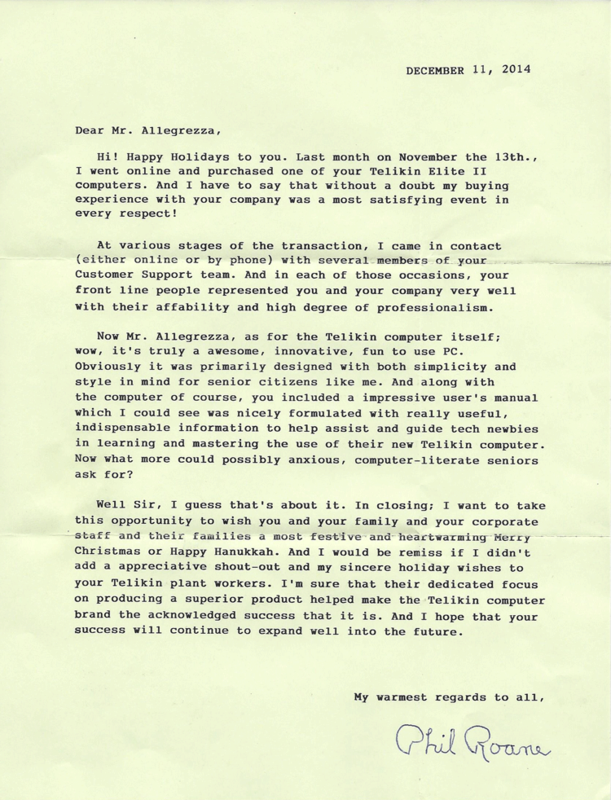 “Hello Telikin Staff, I have wanted a personal computer for a long time, but I did NOT want the complicated problems that can go with it. I am a senior and so I was cautious about this. I decided to get a 20" touch screen Telikin because this computer seemed to be less complex & easier for a senior to deal with. It was a very good decision. I got my computer & printer copier in Aug. 2011. I now exchange E mails with friends & family, do on-line searches, and one of my favorite things to do is to watch videos of my favorite artists. I really love the fact that Telikin can send me a blog from time to time with new information & it rolls right off the printer so I can look at the copy whenever I choose. Also when used as a copy machine I often do copies in color which I enjoy. Also Telikin has a very nice staff of people who can help if there are any questions. “One year ago, we gave my 71-year-old mother an android-tablet (which I setup first and shipped to her) as entertainment and to be able to see her family's facebook pages, e-mail, etc. As a result of 50+ years of rheumatoid arthritis (diagnosed when she was 16) a touch-screen, using a stylus, was imperative. Surprising us all (the woman never used a computer in her life, and still types invoices for a family business on an old electric typwriter) she used her little 8-inch tablet CONSTANTLY. Yes, she plays Words with Friends, Angry Birds, a few non-revenue gambling games, watches Netflix, etc. Now, I'm fairly tech-savvy, and subscribe to the "do it without the book first" modus operandi. In less than 20 minutes, out of the box, we had the Telikin up & running, connected to wifi, facebook, e-mail, and she was able to do most basic tasks without help. Seriously... If I had given her a laptop... a MacBook, even... do you suppose that would have been the case? No. I'm in the graphics industry, and have run both Mac & PC... I have a bit of experience here. I did have to call tech support once regarding my facebook photos not showing up in her gallery. Want to talk about good customer service? Three thumbs up (that is, if I had a third thumb). They answered fast, spoke english, were courteous, and SOLVED the problem. How about that? A few things which clearly differed from the tablet: No Netflix. this IS a bummer, but there are a number of streaming video services which the Telikin handles just fine. Hopefully, in the future, they remedy this issue. Games: Both Angry Birds and Words with Friends must be played on the Telikin using a web-based interface (as opposed to an app) I created bookmarks to the facebook versions of both and linked to her facebook login. They had a learning-curve of about 15 minutes, and work flawlessly. One exceptionally cool feature -- the Telikin automatically imports her facebook friends AND their photo albums (depending on their permissions restrictions) which means grandma can now see all new photos I upload to my facebook profile, and can even save them to a folder that the Telikin uses as a screen-saver. Kudos, Telikin. Grandma now has a 20 (or 18)-inch HD digital-frame... Well done. “Over the years I've looked at several computers which were "senior friendly". In the past, they all pretty much were shells over Windows, which essentially added another layer of code that could go wrong. This computer is Linux-based, and everything is coded from the ground up for senior use. Although my mother is not a complete technophobe, she is not comfortable with technology, and my father retired early rather than deal with computers in his business, so he would never allow one in the house. A couple years ago she bought an HP laptop and hired a woman to help her set it up and learn how to use it. SInce the woman was a senior herself, we thought this might work out ok. It has been a disaster. There were so many cautions and "don't do this" and different menus involved that she would get frustrated and eventually quit trying. Add to this trying to deal with at&t's email system and she hasn't gone near it in months. A couple weeks ago she decided to give it another go and things turned into a complete farce, until I finally figured what the consultant had done and also determined that there is an apparent fault in the keyboard. Then my mother spotted this computer in the aarp magazine (it is marketed there under another name -- but it is the same machine-at the same price,). When it first arrived and she opened the box and saw cables and a keyboard box she felt a little intimidated and was ready to send it back, but she called the company and calmed down a bit, and then told me about it and showed me the ad. When I went online I realized it was the same machine that was getting good reviews and that nothing else out there seems to be in the same class, so I convinced her it give it a try. There is a 60 day trial period, during which she gets free "VIP" service, which normally runs about $10 a month. On the day I was set to help her set it up, she opened the box, and, following the pictures in the manual (which runs to almost 100 large-type pages), had everything connected before we got there. While she and my wife were talking, I had it up and running.in about 10 minutes (or less). We set her up with a new gmail account and within a few minutes she was in front of the machine. To begin with, she was impressed with how bright the screen was (although it can be adjusted) and how easy everything was to read. When I showed her how she could navigate using the touch screen buttons down the left side she was thrilled. She was happy that she didn't have to log in (you can set it up for different users but we didn't need to) The web home page has links to pretty much the web pages she'll most need, but additional sites can be added. All the links are at least one inch buttons and logos as well as names and, of course, operate by touch. She was pleased that she doesn't need to use the mouse and only needs the keyboard when actually putting information in. We had a minor issue with email and called the support number. They are open until 8pm eastern time and we called at 7:55. After about a two minute wait, the US based support person answered. You could tell it was end of the day, but the person talked us through the issue. Try calling any other computer company five minutes before tech support closes and see how far you get. And that's the important point. This review has already rambled on too long, but there are many features of the operating system that were clearly thought through for seniors and those uncomfortable with computers for whatever reason. And you can't mess it up. That, more than anything else, makes it worth while for my mother. All software, security, and system updates are sent automatically by the company, so there are no annoying popups or emails.or concerns about how to download and install. Microsoft is no longer offering MSN TV or WebTV to new customers, Telikin is the perfect full-featured alternative. Like WebTV, Telikin provides Email, Web Browsing, News, Weather, Entertainment and adds full computer capabilities including Video Chat, Word Processing, Spreadsheets, DVD and CD player, Games and more. Telikin's easy to use touchscreen and intuitive interface makes it an excellent upgrade from WebTV. Best of all, regular software updates are free! Copyright (c) 2019 Venture 3 Systems LLC. All rights reserved.